Do I really need my boiler serviced or checked each year? Click here to see why you should. From £55* and from £45* per additional appliance. The gas safety test will ensure the appliance is safe to use for the next 12 months, subject to passing current regulatory requirements. However it is wise to have a full service the following year. A gas safety certificate plus a report on the condition of your gas appliance will be issued if your appliance meets current regulations. This will also give you a good indication of any future work required. The one most people have. From £65* for boilers. Additional appliances from £45* per appliance if done on the same visit. Your boiler will be serviced and certificated as safe, subject to passing current regulatory requirements. This involves testing, cleaning, calibrating and gas analysing. A gas safety certificate plus a report on the condition of your boiler will be issued if your boiler meets current regulations. This will also give you a good indication of any future work required. Check the appliance is positioned in the right place. Check any flue or chimney serving the appliance is safe and installed correctly. Run a flue combustion test to ensure there are no unsafe emissions escaping from your appliance. Run a gas tightness test. Check & test appliances and controls are operating correctly and are safe to use. Check (and rectify if required) the release valve outlet is turned to the wall. Check condensate pipes are working, positioned and insulated correctly. Check your appliance is burning correctly and not producing Carbon Monoxide. Check & test all the safety devices are working. Test the rate of gas consumption or the working gas pressure to ensure the appliance is operating correctly and adjust if necessary. Visually inspect the appliance to check for corrosion and leaks. Clean the appliance inside and out. Check & test the electrical connections. Issue a gas safety certificate. Your next appliance service reserved for 12 months time. Boiler and appliance servicing prices are based on a fully functioning appliance that requires servicing and safety testing only. For boiler or appliance repairs please call or e-mail for more information. Don't forget ALL gas appliances need servicing. Keeping you safe. Saving you money. How to check your gas engineer is registered to do your gas work. Is the picture on it the person standing in front of you. Check the registration number. Mine is 535829. Turn it over and check the elements. This is a list of work this person is qualified to do. If it isn't listed then the engineer isn't allowed to do the work. For instance, I can do all domestic work but am not allowed to touch commercial gas installation. A gas engineer will never mind you checking. 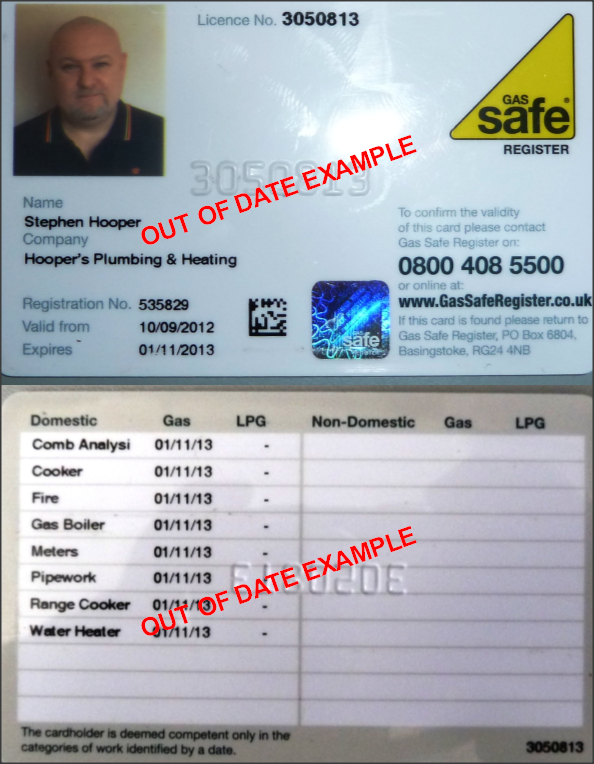 Please note Gas Safety cards are issued annually so check the dates. The above photo shows an old card for an example.